To be completely honest, I’ve never been much of a water person. In fact, I can’t swim (despite a year of lessons as a child – the class I took was called “Terrorific”), and large bodies of water intimidate me for that reason. Lake lovers, don’t write me off quite yet. I am from Wisconsin and can fully appreciate the beauty of a lake. It just wasn’t until college that I began to understand the power a lake can have. I started attending the University of Wisconsin-Madison my sophomore year of college. Transferring schools can be a bit isolating – you feel like you’re joining the scene after everyone else has already become acclimated, but you’re not quite as naive and enthusiastic as the freshmen. Not to mention, UW-Madison has an enormous student population of over 40,000 – I was coming from a college of under 2,000 students. I remember one of my biggest fears was getting lost or not knowing where to go for various errands and whatnot, so I spent a lot of time walking around Madison during my first few weeks there. 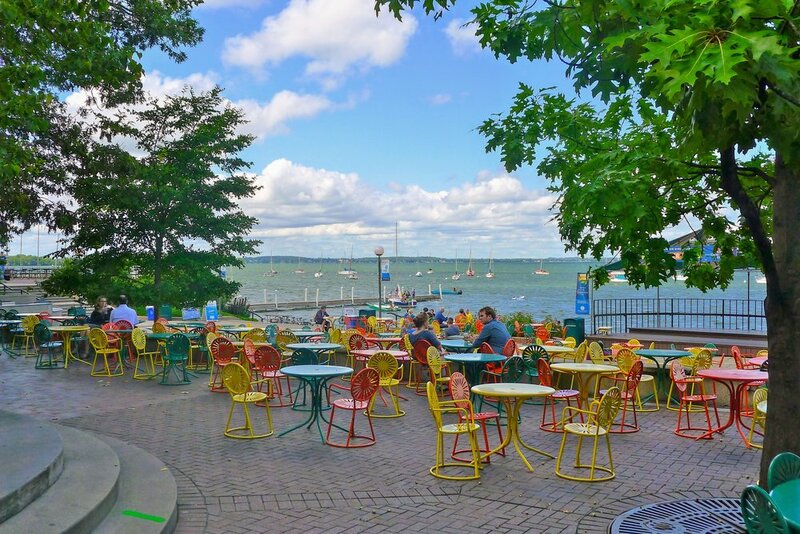 Whether I was looking to see which buildings my classes were in or perusing State Street, I somehow always ended up on the Terrace at Memorial Union overlooking Lake Mendota. I was pulled there like a magnet – it’s as if I blinked and ended up on the Terrace magically. My anxiousness seemed to dissipate into the gentle waves of the lake. Because I transferred schools, then changed my major a year later, I wasn’t able to graduate in the spring of 2012, like most of my friends; I still had another year to go. I was pretty upset and needed to escape. After my last exam before summer break, my mom was waiting for me in my apartment. I dropped off my backpack, threw some clothes in a bag, and we hopped in the car and immediately made the 6-hour drive to Bayfield, Wisconsin. My aunt and uncle live there, and it’s magical. A 2-minute walk from their front door is a little beach on Lake Superior. We’ve spent a lot of time there as a family, but this particular trip was medicinal. I couldn’t get enough of Superior’s magical calming powers. I guess what I’m trying to say is that even though I didn’t live on a lake or have some of the same experiences as many lake-lovers growing up, I get it. I really do. Lakes are beautiful, they are magnetic, and best of all, they wash away negativity in life that nothing else can. I’m excited to be back in the Midwest to experience Lake Life again.